Meigs senior Becca Pullins (33) lines up for a three-pointer over EHS senior Alyson Bailey (24), during the Lady Marauders’ 61-35 victory on Monday in Rocksprings, Ohio. Eastern sophomore Sydney Sanders releases a pass over Meigs senior Taylor Swartz (22), during the Lady Marauders’ 61-35 victory on Monday in Rocksprings, Ohio. ROCKSPRINGS, Ohio — Snapping their skid with a vengeance. 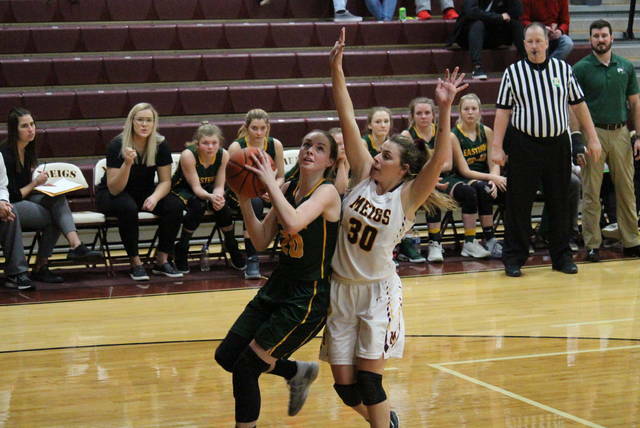 The Meigs girls basketball team led wire-to-wire en route to a 61-35 victory over non-conference guest Eastern on Monday in Larry R. Morrison Gymnasium, ending the Lady Marauders string of three straight losses. 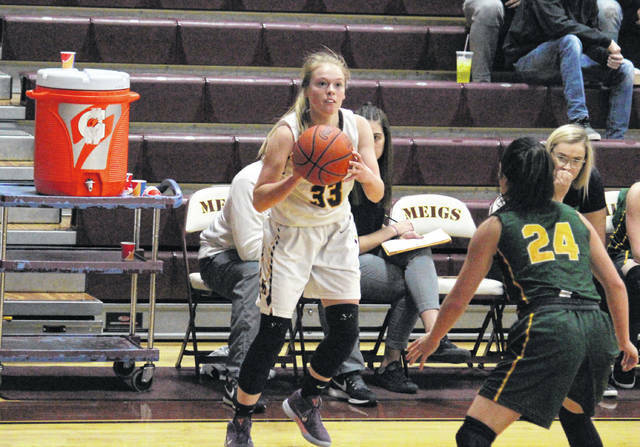 Meigs (10-7) scored the first seven points of the game, before surrendering a 5-0 run to the Lady Eagles (9-6). The Lady Marauders ended the quarter with a 9-to-3 spurt and headed into the second quarter with a 16-10 lead. The guests scored the first two points of the period, but MHS hit back-to-back three-pointers and led 22-12 with seven minutes left in the half. Both teams scored seven points over the next 3:30, but the Lady Marauders closed the half with a 10-to-2 run and a 39-21 advantage. The MHS lead grew as high as 25 points in the third quarter, and the hosts settled for a 52-29 edge headed into the finale. The Maroon and Gold pushed their advantage as high as 27 points in the fourth, cruising to the 61-35 victory. Following the triumph, third-year MHS head coach Jarrod Kasun talked about what led the Lady Marauders. It’s the first time in Kasun’s tenure that the Lady Marauders are queens of Meigs County, going unbeaten against in-county opponents. Kasun was glad to see his team get back in the win column, and play a complete team game. For the contest, the Lady Marauders shot 23-of-52 (44.2 percent) from the field, including 10-of-27 (37 percent) from three-point range, with half of the hosts’ trifectas coming in the second period. Eastern made 13-of-43 (30.2 percent) field goal tries, including just 1-of-11 (9.1 percent) three-point attempts. At the free throw line, MHS was 5-of-9 (55.6 percent) and EHS was 8-of-12 (75 percent). 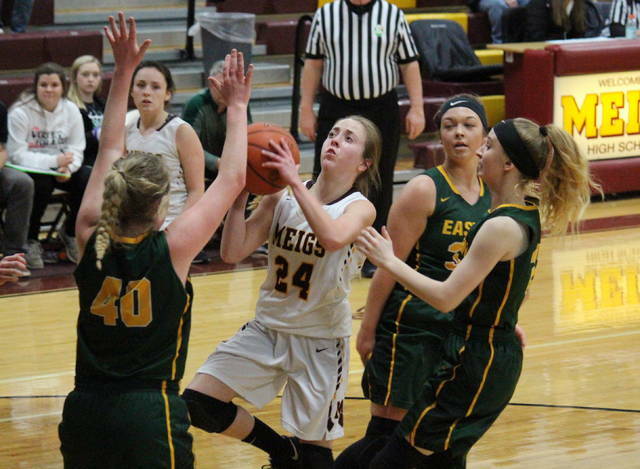 Meigs won the rebounding battle by a 33-to-22 clip, including 14-to-7 on the offensive end. The Lady Marauders committed just 10 turnovers in the game, four fewer than the Lady Eagles. Collectively, the Maroon and Gold earned 20 assists, eight steals and three blocked shots. Meanwhile, the guests came up with six assists, four steals and one rejection. MHS freshman Mallory Hawley hit three trifectas and finished with a game-high 19 points, while blocking two shots for the hosts. Kassidy Betzing also made a trio of three-pointers on her way to 14 points, to go with game-bests of seven assists and three steals. 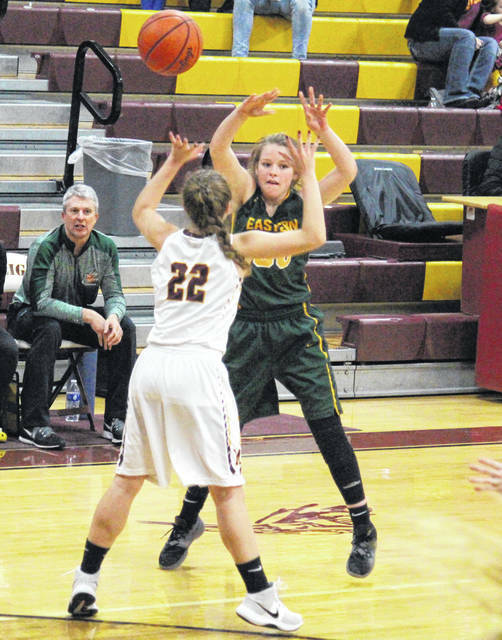 Madison Fields scored 13 points for the Lady Marauders, Becca Pullins added eight points, while Marissa Noble came up with three. Kylee Blanks and Taylor Swartz scored two points apiece for Meigs, with Swartz grabbing a game-best 10 rebounds. Alyson Bailey led the Lady Eagles with 15 points, combining five field goals and a 5-of-7 day at the free throw line. Olivia Barber scored nine points for the guests, and Kennadi Rockhold finished seven points and a team-best five rebounds, while hitting the team’s only three-pointer. Jess Parker rounded out the EHS offense with four points and two assists, with Kelsey Casto also picking up a pair of assists. Ashton Guthrie paced the Eastern defense with two steals, while Kennadi Rockhold added a steal and a block. Both teams are back in action in their respective leagues on Thursday, with Meigs visiting Alexander, and Eastern hosting Trimble.